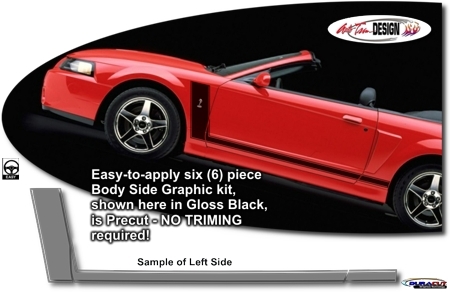 Hit the street with this awesome body side graphic kit for your '99-'04 Ford Mustang. This retro "Hockey Stick" style graphic is very easy to install and features a .25" (6.35mm) pinstripe at each side as shown. Installation of the graphic set is very easy and requires no trimming. Careful removal and reinstallation of the decorative fender emblem(s) may be required.